European blogger: Who will take control of France’s parliament? The battle lines have been drawn and 6,500 candidates are gearing up for the start of the French parliamentary elections campaign. On June 10th and 17th the two rounds of the elections will take place for 577 seats where the socialists need to win a majority in parliament in order to support the policies and reform plans of President François Hollande. They are hoping to continue riding the wave that saw his historic win this month, but will not take anything for granted with their campaign slogan being “Give a majority to change”. The result of the legislative elections also has a direct impact on the make-up of Hollande’s government, with 26 out of the 34 members are standing in the elections, including newly appointed prime minister Jean-Marc Ayrau. The socialists are taking a risk by not signing up with the far-left ‘Left Front’ coalition, although this could change as the campaign progresses. UMP candidates, meanwhile, will be contemplating whether Nicolas Sarkozy’s departure will help or hinder their campaigns. 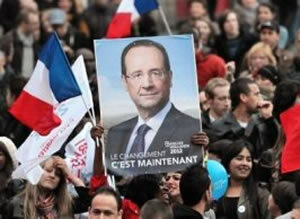 If they gain enough seats it could spell trouble for Hollande. UMP has held the majority in parliament for the past 10 years. Even so, UMP may have to decide whether to court the far right as Sarkozy did in the presidential elections in order to keep their majority. Marine Le Pen has indicated alliances could be possible in the parliamentary elections, even though this was not the case for the presidential campaign. UMP’s French defence minister Gérard Longuet and MP have recently indicated talks with Front National are a possibility. Current polls indicate the socialists are at 46%, UMP 33%, and Front National 17%.